A great value for the reader is that once you’ve read through this publication, you’ll have an objective basis from which to evaluate the condition of your windows and also the recommendations of those who bid on your stained glass restoration project. 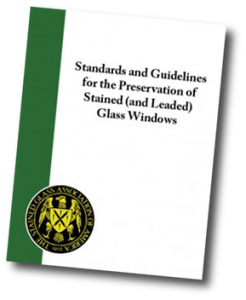 Get your free, no obligation copy of the SGAA Standards and Guidelines (offered to religious and lay leaders, building owners, architects and construction managers responsible for the care of stained glass). Note to homeowners and other stained glass studios: this guide is offered only to religious and institutional building owners, their leadership and building committees and the architects and construction managers who serve these facilities. Thank you for your understanding. Get your FREE SGAA Guide here (USPS mailing address needed since it is hard copy).